The Notarized Bill of Sale Form is a document that allows the transfer of any type of personal property (vehicle, boat, etc.) that is witnessed by a notary public. This designation is provided by every State and when a Notary signs a document, it becomes legally witnessed. 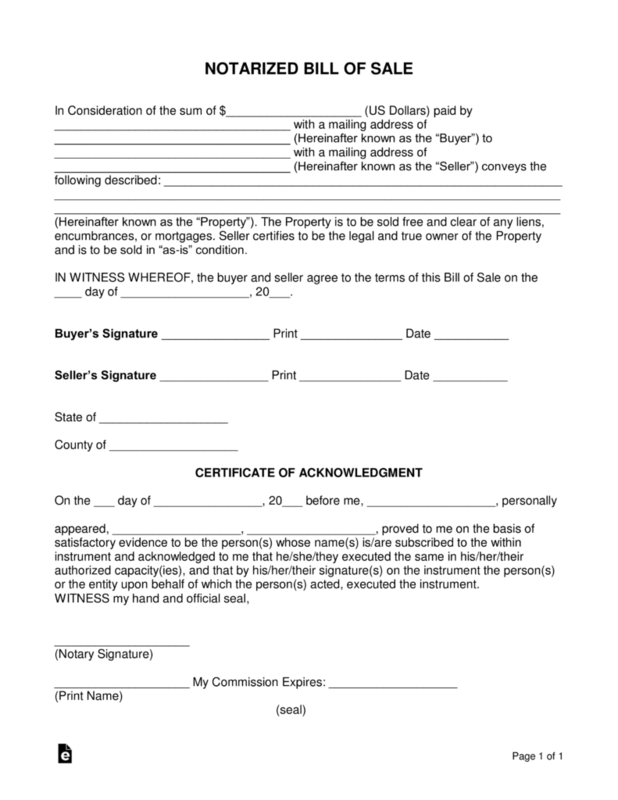 The form is complete when it has been filled in with a description of the property being sold and signed by the buyer and seller in the witness of the notary public. A copy should be given to each party for their records. Why Is It Important to Notarize a Bill of Sale? 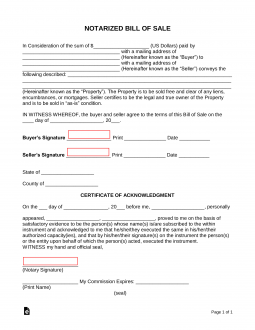 A bill of sale document is used for all sorts of private purchases and transactions. The most common is for motor vehicles, but it can also be used for transferring ownership of trailers, firearms, businesses, equipment, and just about anything else of value. And while notarizing a bill of sale isn’t always required by local, state and federal laws, it is strongly recommended. The first and most important reason to have a bill of sale notarized is to prevent fraud. A public notary acts as a witness to the transaction and places an official seal over the terms of the bill of sale. This means the contract of the sale is set in stone and a record is kept with the local notary’s office. This ensures that the seller gets paid and the buyer gets the merchandise. Most attempts of fraud or misconduct will be mitigated by having this official witness. Though a Certificate of Authority isn’t necessary for every private exchange, it is required for certain purchases. These requirements are set by the local and state governments. Some examples are vehicles, airplanes, heavy machinery, and firearms. Again, this changes from state to state. So make sure to stay up-to-date with your specific state laws and regulations. And last but not least, a notarized bill of sale may be required to process other important paperwork. Ownership isn’t always transferred with a finalized bill of sale. Sometimes a title needs to be transferred or registration papers filled out. Some public offices and agencies won’t even move forward with the paperwork without an official Certificate of Authority or seal from your public notary. Bank Branch – If you are an account holder at any financial institution (bank, credit union, etc.) a branch location will usually offer these services for free. UPS Store – Most UPS stores offer notary services. 123notary.com – Use their locator to find notaries listed that offer their services.